Address: Budapest on the Pest side of Budapest is in Revay, near The Opera House and St. Stephen's Basilika. 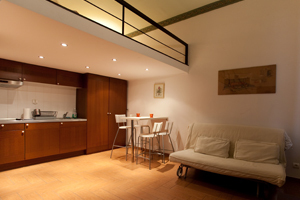 Living space: 24 square meters + 10 square meters of gallery. Style: Apartment with white stucco, modern furnishings. Rooms: 1 bedroom loft, living room, kitchen and bathroom.. Amenities: Charming apartment, cool in summer and warm in winter thanks to the ancient structure of the building from the early '900. Completely renovated in a functional way. Has 4 beds (one double bed in the loft and a sofa bed in the living room below). Well equipped kitchen (fridge, stove, pots, plates and dishes and in any case everything you need to cook). Bathroom with shower / small tub. Washing machine. Including linen (sheets and towels), free city maps, weekly cleaning. Location: Located in the heart of the city, on the Pest side, close of the world famous world heritage Andrássy avenue and 100 meters from St. Stephen's Basilika and the Opera House, where there is a stop of the oldest underground on the continent. A strategic position for those who want to move on foot or by public transport (tram 4, 6, and Metro 1 yellow line). A two minute walk from Liszt Ferenc Square, the heart of the "nightlife" with bars, restaurants and cafes. A 5-minute metro ride from the beautiful Szechenyi Bath. We can offer a transfer by private car waiting for you at the airport at a cost of 20 Euro for up to 4 people. bus number 200 to Köbánya-Kispest -> Metró 3 (blue line) to Deák tér -> Metró 1 (yellow line) for Opera -> and 100 meters walk to the apartment.